To some, the Bible is a sacred text while to others, even as skeptics, it is still an integral part of the culture. While many people claim that the Bible is the most important book in the world, many have never read it! 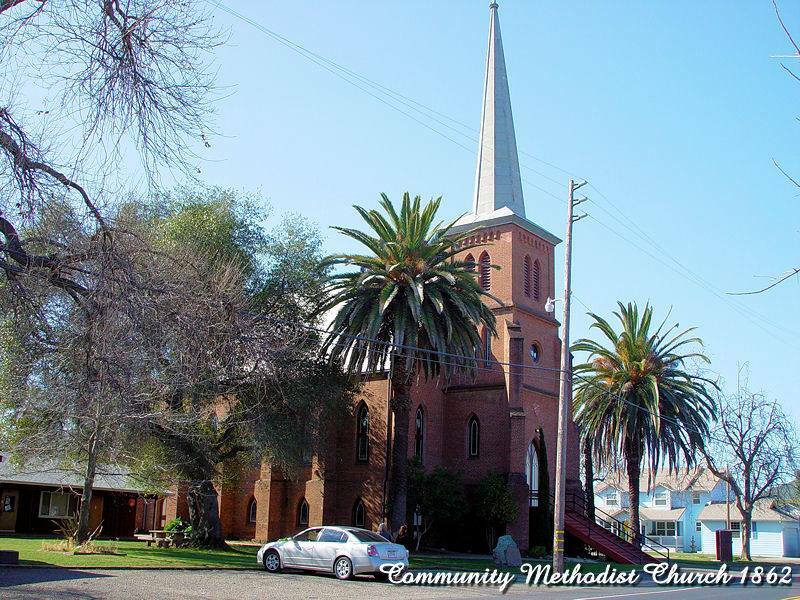 Trinity Episcopal Church is inviting the Amador and neighboring communities to change that. Trinity is inviting the community to take “The Bible Challenge” – a way to read the entire Bible in only one year. It begins on Epiphany Sunday, January 6, 2013. “The Bible Challenge” offers an accessible schedule of reading two or three Old Testament chapters, one Psalm and one chapter from a New Testament book each day, in order, requiring approximately 15-30 minutes per day. While it is possible to get behind in readings, all are encouraged to catch up a bit at a time and not to give up the challenge. Trinity Church will have an optional blessing of any Bibles brought to be used during “The Bible Challenge” on January 6, 2013 (Epiphany) at the regular 8:30 and 10:30 services. Day 1 of the readings begin on Monday, January 7. Since some parts of the Bible can appear very difficult or intimidating, there is a companion set of one-page daily meditations, contributed by Bible scholars from around the world, to help put some ideas into contexts that are useful for 21st century readers. Anyone interested in being more knowledgeable of the Bible is invited to participate with Trinity in this spiritual and educational experience. It is not necessary to be a member or to attend church services. 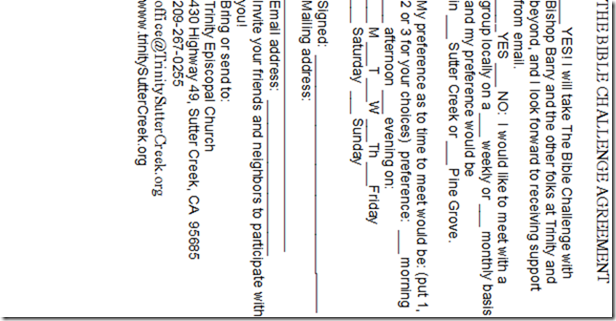 Just contact Trinity to request a reading schedule – free. Name and contact information are requested in order to provide follow-up supports as they come available – NOT requests for money or home visits. Trinity would like to know how many people in the Amador and surrounding community are reading the Bible together. A complete form is below. The daily meditations to accompany readings are an asset and are available in book form ($18 from Forward Movement Publications, or they may be downloaded a week’s worth of meditations at a time – at no charge – from the Episcopal Diocese of Northern California website at www.norcalepiscopal.org/thebiblechallenge. “The Bible Challenge” and daily reading schedule are the brainchild of the Rev. Marek Zabriskie, rector of St. Thomas Episcopal Church in Fort Washington, PA. 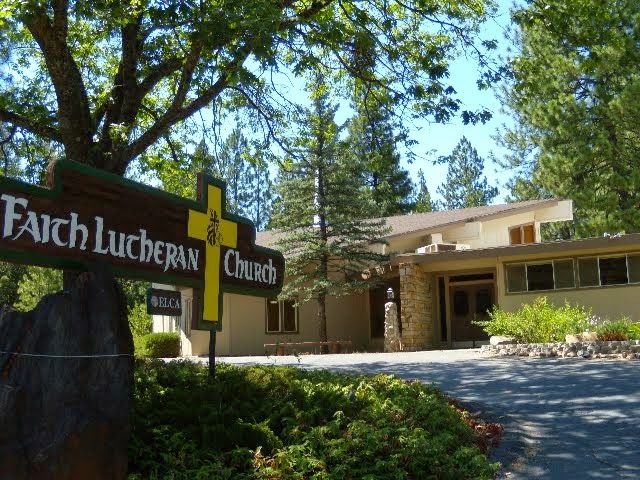 It is being adopted by the entire Episcopal Diocese of Northern California, led by the Bishop Barry L. Beisner, as a collaborative spiritual effort for 2013. For more information about The Bible Challenge or The Episcopal Diocese of Northern California, please visit www.norcalepiscopal.org or e-mail biblechallenge@norcalepiscopal.org. Trinity Church women will be having its annual luncheon Saturday Dec 1st at the Castle Oaks Golf Course in Ione. Cost is $20.00 and tickets will be available for sale the next two Sundays following church, scholarships can be made available. Call the church at 267-0255 for more information. All women are invited. Please bring a friend! “A Thrill of Hope: Pre-Advent Retreat this Saturday (11/17) from 9AM to 12PM at Trinity Epsicopal Church, Sutter Creek. Do you need to hear a message of hope? Do you want to experience more meaning during this Advent-Christmas Season? If so, this gathering is for you. Men, women, and children are invited to a free pre-advent retreat. Music, scripture, reflections, and more will fill the morning as we slow down together before the busy time of advent. What a wonderful chance to reflect on the light, the gift, and the hope of the season! Hope to see you on Saturday in the Church Sanctuary. We will begin promptly at 9 AM! The theme of our annual Winter Festival on Advent Sunday November 25 is Birthing a New World. The morning session begins at 10:30 with The Mother: Spiritual Midwifery and the Mystery of Birth followed by a Potluck Winter Soup Lunch. The afternoon session focuses on The Child: Developing Bio-Spiritual Senses for a New World ending at 4:30. The virtue study this month is “Transformation”. Sunday Meditation starts at 10:30 and Wisdom Circle at 11:15. Other weekly activities include: Qigong, Sunday 5pm; ACIM study group, Tuesday 7pm; Chi Meditation, Wednesday 6pm and Spiritual Practices 7pm. The interfaith spiritual center is located at 270A Hanford Street in Sutter Creek. Call Rev. Patsy at 209-418-9003 or visit www.sophiaswell.org for more information. Whether you spell it Chanukah, Hanukah, or Hanukkah, the eight-day Jewish "festival of lights" is celebrated each December. But unlike Christmas, the dates are even more variable than the holiday’s spelling! This year, the first night of menorah candle lighting takes place on Saturday night, December 8th. 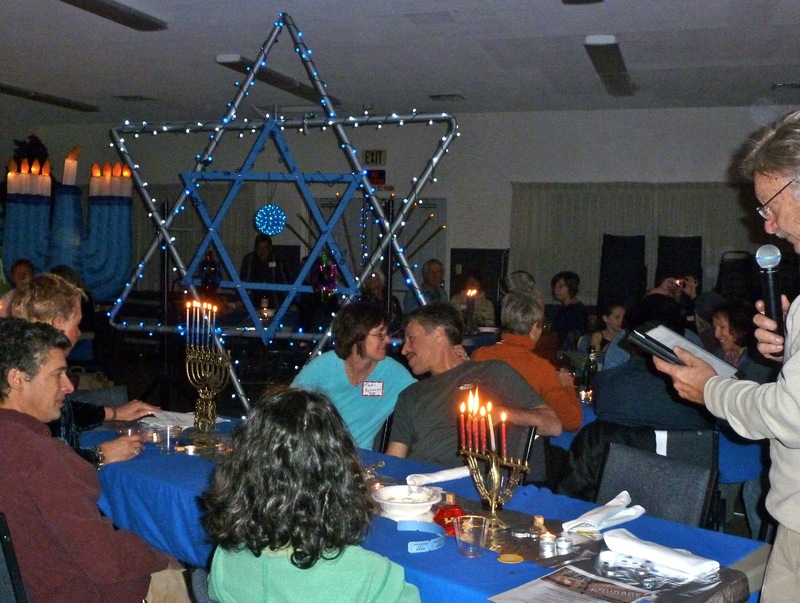 The Mother Lode Jewish Community (MLJC) will be holding its annual Hanukkah party on the 7th night, Saturday, December 15 at 5 p.m. in Murphys, CA. This is a casual, fun evening for both adults of all ages and children. You don’t have to be a member to participate! If you wish to attend, please call ahead to reserve your place, as space is limited. There is no charge, but we ask everyone to bring a potluck dish to share. Volunteers are also needed to help set up and clean up. We also need a few volunteers to make latkes ahead of time. If you are interested in attending, please call the Mother Lode Jewish Community at 209-533-1650 or email the MLJC at motherlodejc@yahoo.com for additional information, reservations and directions. The MLJC’s mission is to provide opportunities and events that nurture a vibrant and enduring Jewish identity, culture and community in the Mother Lode, drawing members from Amador, Calaveras, Tuolumne and Mariposa Counties. The activity calendar includes at least one activity a month, primarily in the Murphys and Sonora areas. New members are always welcome. Prodigal Sons Motorcycle Ministry Club from Manteca, California paid a visit to the Pine Grove Youth Conservation Camp to spread the gospel and share words of wisdom to the youth at the camp. This group has been coming to Pine Grove Camp for at over 10 years. Led by Pastor Dave Blanco, they come twice a year to try to inspire the youth to make positive changes in their lives. 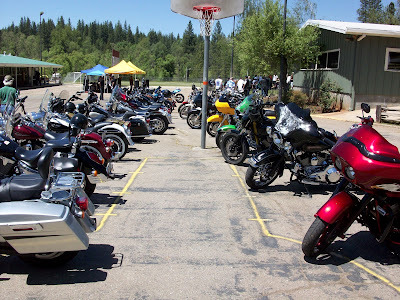 About thirty five motorcycles and cars drove into the camp that afternoon. They set up a band to share some inspirational music with the guys. Several of the visitors shared their testimonies with the youth about the struggles they had gone through, but were able to overcome the obstacles in their path. They shared stories of hope and faith with the youth to show them that it was possible to reach their goals. A young man who is the grandson of one of the band members came to the camp to share his story. His name is Johnny Maxwell, and he’s currently on the show X Factor vying for a singing career. He sang several songs, and danced along with the crowd. 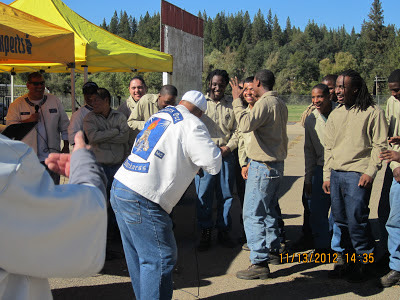 The guys really enjoyed listening to Johnny and learning lots of dancing skills from him. Everyone had a great time. They sang, danced and talked with the visitors taking in lots of knowledge that they had to share. 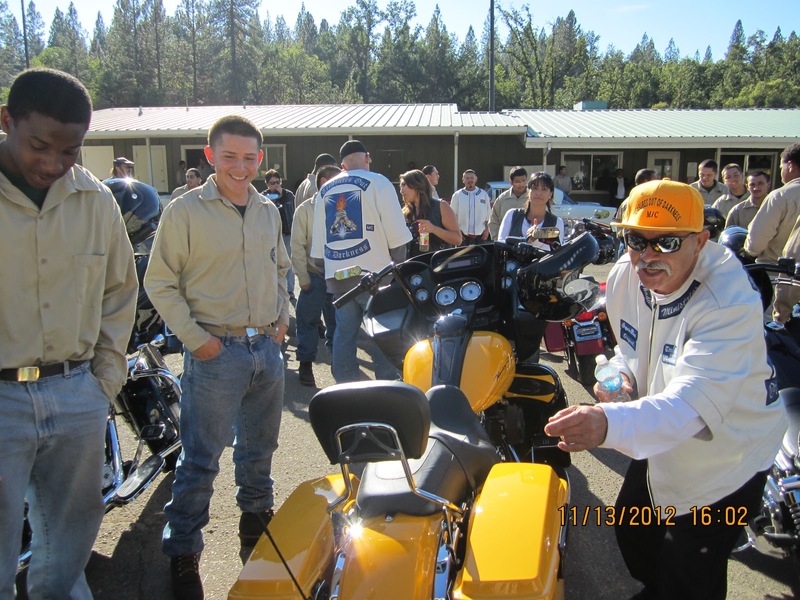 After the music ended, the youth got to inspect the motorcycles and take photos with them. The kitchen provided a wonderful dinner of double cheeseburgers, fries, brownies and beverages. The great meal was enjoyed while they talked with each other. They will return to Pine Grove Camp in May to share more inspiring words with the youth. All are cordially invited to participate in the Las Posadas Candlelight Walk in Sutter Creek on Saturday, Dec. 8, rain or shine. This is a re-enactment of Mary and Joseph’s search for a place to rest, complete with a narration of the Christmas story and the singing of familiar carols. The walk begins at 7:00 p.m. on Spanish Street near the Catholic Church, where participants receive candles and programs. The procession winds through downtown Sutter Creek, following Mary on her mule, and ends at the stable outside the Methodist Church. Inside, warm beverages and cookies will be served. This is a lovely, non-commercial way to begin the season of Advent, to enjoy the beauty of Sutter Creek decorated for the season, and to be a part of this annual community event.